(686 S. Main St., Moab, Utah). It’s mid-afternoon on a Saturday in spring and the parking lot that fronts the bustling brewpub is packed. A quick reconnaissance reveals license plates from Utah, Colorado, California, Idaho, New Mexico, Florida, Louisiana, Texas, Wyoming and British Columbia. Many vehicles are carrying mountain bikes. A few have kayaks attached to roof racks. A half-dozen Jeeps are coated with red mud and dust. Beyond the lot, a line of RVs is parked along the side of Highway 191, which bisects the town and passes the brewpub. The scene is typical during Moab’s long tourist season, which extends from the end of ski season through Thanksgiving. The remote town of 5,000 adrenaline-charged residents sits in the heart of Southern Utah’s red rock canyon country, close to Arches National Park and Canyonlands National Park. Superlatives such as “spectacular” or “jaw-dropping” barely do justice to the region’s surreal chiseled landscapes. The Moab area is considered a world-class destination for mountain bikers, hikers, rock climbers, river runners, off-road vehicle enthusiasts and those who simply like to gawk at the vistas from atop sheer-walled cliffs 2,000 feet above the Colorado River. Each year, over a million visitors descend upon Moab. And all of them, it seems, find their way to Moab Brewery during their visit. Van Horn, a Utah native, arrived in Moab in 2002 after working at Uinta Brewing Co. in Salt Lake City. Under his direction, the brewery has grown from a modest draft-only operation into a packaging production brewery with distribution in eight states scattered throughout the Mountain West, West Coast and mid-Atlantic. When you enter the faux-Southwestern-style building, the first thing you come upon, surprisingly, is an ice cream counter. It does a brisk business dispensing scoops of house-made gelato to diners, including lots of children, as they exit into the dry desert climate. Behind the counter, a gift shop is well-stocked with T-shirts, bike shirts, hats, glassware and all manner of brewery paraphernalia. The large interior space is divided into several dining areas and a bar section enclosed by a glass-topped half wall. The décor plays on the outdoor recreation theme. Murals of canyon country scenes adorn several wall surfaces. Throughout the space, a collection of bicycles is on display as is one-half of a Jeep advertising off-road tours. A raft, a kayak and a parachute promoting a skydiving company are suspended from the ceiling. To thirsty brewpub visitors from out of state, Utah’s quirky alcohol laws can be a bit confounding, though they provide great fodder for conversation at the lively bar. For example, when you order a beer in the dining room, you must also order food. This rule does not apply in the bar area, which is restricted to persons 21 and older. The brewery keeps 10 beers on tap in familiar American, British and German styles. The Rocket Bike Amber Lager, a California common, was a 2014 Great American Beer Festival medal winner. Although you can purchase unlimited 2-ounce samples of the draft beers for 65 cents each (sorry, free samples are verboten in Utah), if you want to purchase a flight of samples, well, fuggedaboutit. By law, you’re only permitted to purchase two beers of any size at one time. Two pints at once? No problem. Three 2-ounce samples? No way. All the draft beer is restricted to 4% ABV. Does this mean you’re limited to drinking only session beers during your Moab Brewery visit? Heck, no. The brewpub produces a variety of packaged beers that are full-strength and higher. During my most-recent visit, two canned beers were available for in-house consumption including a 6% pale ale and a 7% IPA. Also available were three bomber-size, 8.6% bottle-conditioned ales, including a black imperial IPA, a tripel and a Scotch ale. Van Horn refers to the bottled series as “some good brewer’s art.” The canned and bottled beers, as well as growlers and Crowlers of the draft beers, are available to-go, even on Sundays and holidays when regular state liquor stores are closed. Go figure. 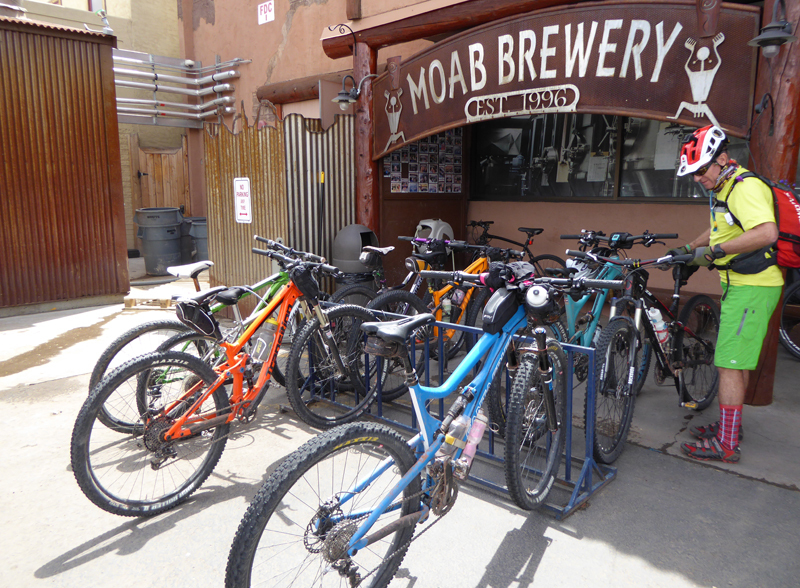 Moab Brewery carries at least five licenses in order to produce, package, serve, sell and distribute beer. “They’ve never made anything easy around here,” Van Horn says jokingly. But when you live and work in one of the most incredible areas on earth, you don’t sweat the small stuff.